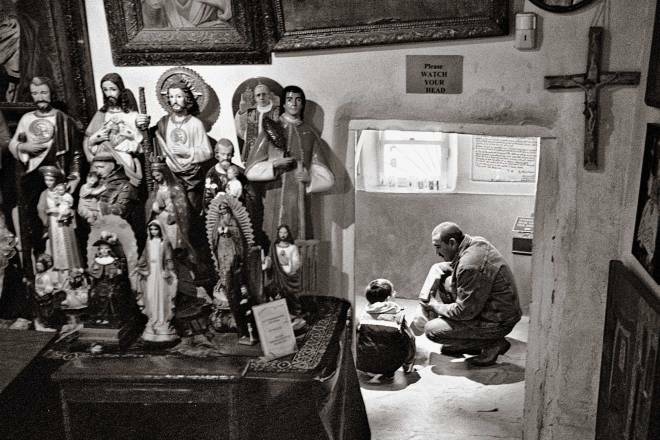 Above: A man and boy kneel to collect healing dirt inside El Santuario de Chimayó. Thousands of pilgrims—many on foot—will flock to the chapel on the days leading up to Easter, April 16. In Chimayó is the famous El Santuario, a small chapel on a side road about a mile south of the settlement. To this site on which this inspiring, diminutive church is built, the Pueblo Indians, long before the Spanish came to this section of New Mexico, made regular visits, for they had discovered a peculiar cool spring, the waters of which stopped their pains, healed their wounds, and gave them new vitality. When the Spanish came, the spring had dried up, but they, too, discovered that when the earth from around this spring was applied to any part of the body where there was an affliction, the pain stopped, and the ailment disappeared. And through the years an increasing number of persons have made the pilgrimage to El Santuario to be healed of their distresses by this “holy earth,” and to carry some of it back to their relatives and friends.